On New Years Day we took a walk in Greenwood Cemetary, where Basquiat an Asher B. Durand (among others) are buried and where a flock of parrots, adapted to NYC temperature, live in gothic spires. 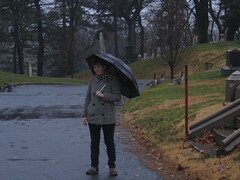 There was also a flock of geese waddling among the tombs. The walk reminded me of getting lost with G. and H. this summer in Cimietre Pere Lachaisse in Paris, not finding Oscar Wilde’s tomb and wandering around for awhile until we found an exit. I’m starting to realize I like the aesthetics of umbrellas. This entry was posted in Brooklyn, New York and tagged Uncategorized. Bookmark the permalink.